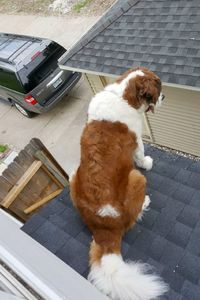 A 180-pound Saint Bernard named Whiskey made his way out to the roof of his Minnesota home, prompting a one-of-a-kind call to the fire department. 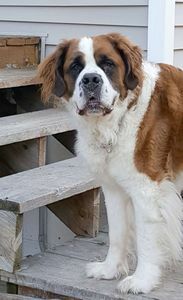 "Homeowner's requesting a ladder, to assist a 180-pound Saint Bernard that is stuck on the roof," the dispatcher could be heard telling the Spring Lake Park Fire Department. Renee Roth was dog-sitting for her son while he was away when Whiskey went missing,” she told a local TY station. "I ran up to see what was happening and the dog wasn't in there, and I just thought the worst," Roth said. After seeing him perched on the roof siding, she attempted to lure him back inside with treats before calling for help. "He was standing there and he kept looking over on the garage. I'm like, 'Don't jump.' I ended up calling the fire department and, thankfully, they came over." Lt. Anthony Scavo said they've received calls in the past for smaller pets but this was a new one. "We do occasionally get the cat-in-the-tree call, but dog on a roof, not so much," Scavo recalled. Battalion Chief Jeremiah Anderson said it was "an organized effort" to get the dog back inside safely. "It was kind of an organized effort of pushing from the outside and pulling from the inside and once Whiskey figured out what we were doing, I think he kind of cooperated and jumped through," he said. The fire department also detailed its methods on Facebook for moving the large dog. "[The] firefighter on the roof lifted his front legs to the window sill, fire crews in the house lifted and pulled him in safe and sound," the post read. Roth said her son is a member of the National Guard and when he gets deployed in September, he may need to find someone else to dog-sit.